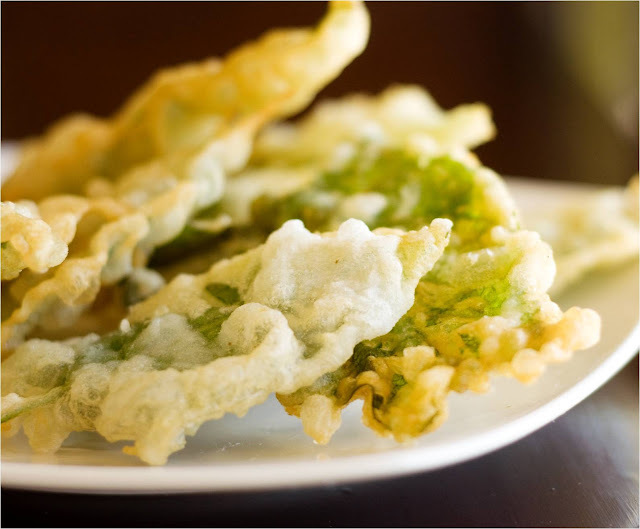 This crisp appetizer or side dish is a great way for adults and kids to eat their vegetables. Rich in nutrients, kangkong contains beta carotene (Vitamin A, iron, phosphorus and thiamin. When buying kangkong, make sure you choose those with large, unblemished leaves that are deep green color. 1 Remove kangkong leaves from stems and rinse thoroughly.Soak leaves in a bowl of cold water for 15 to 20 minutes. Pat dry each kangkong leaf with paper towels. 2 In a bowl, combine flour, cornstarch, salt and pepper. Gradually mix in the water and stir until well blended. 3 In a deep fryer or small saucepan, heat enough oil to fill the pan 2 inches deep. 4 Dip a leaf in the batter and deep fry.Before it turns golden remove and drain on paper towels. 5 Repeat for the remaining leaves, taking care not to overcrowd the pan. 6 Serve with Mama Sita’s Coconut Nectar Vinegar or Mama Sita’s Adobo Dip.